A professional problem solver, Cory Genelin combines knowledge of the law with common sense and leadership experience. Cory’s practice includes civil litigation, employment law, business and banking law. Cory is the Chair of Gislason & Hunter’s Employment , Labor and Benefits Practice Group. He serves as employment counsel for many large and small businesses in southern Minnesota. While no stranger to litigation, Cory excels at producing policies, handbooks and checklists designed to keep problems from ever starting. More importantly, Cory provides his clients with the training they need to implement these policies. 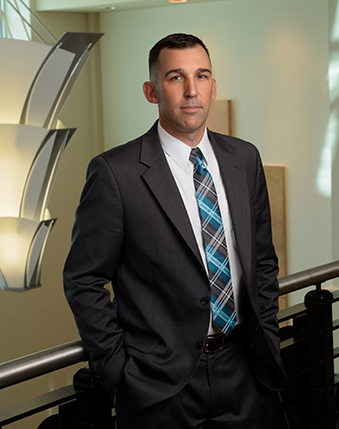 Cory has tried over 100 cases to a verdict including jury trials, court trials, cases before Administrative Law Judges, and even Courts Martial. Cory has litigated cases on contracts, land use, corporate shareholder actions, creditor’s rights, car accidents, will contests, trust disputes, permitting, sexual harassment, employment discrimination, and more. Many of these cases are referrals from local attorneys who respect Cory’s ability to deal with litigation efficiently and care for their clients. In planning and executing complex litigation, Cory draws on his experience as a decorated combat leader. He is able to implement discovery and litigation strategy to attack an opponent’s weakness and keep litigation focused on what matters. Cory serves as general counsel to many mid-sized companies in southern Minnesota. Industries such as Agriculture, Manufacturing, Construction, Finance and many more call upon Cory to provide guidance and counsel on a variety of business and strategic planning issues. He exceeds at working with leadership teams to produce industry-specific business goals with an eye on growth and opportunity. He also serves as a valuable resource to his legal colleagues in providing specific expertise to complex business issues. Cory also represents multiple lenders in southern Minnesota and the metro area. Drawing on Gislason & Hunter’s vast resources and experience in banking law, he provides expert and efficient representation on foreclosures, debt collection and work out agreements. Cory is a Lieutenant Colonel in the Air National Guard with nearly 20 years of service. In his role as the Staff Judge Advocate for the 119th Wing in Fargo, North Dakota, Cory acts as in-house counsel, advising and representing the Wing Commander on a wide range of issues including employment and labor law, contracting, environmental law, military justice, international law and the Law of Armed Conflict. Cory brings this in-house perspective to his civil practice; he looks beyond the immediate issue and to the long term success of every client. Cory is a native and resident of Le Sueur, Minnesota. He grew up working in agriculture. In his spare time he enjoys coaching youth wrestling and football, fishing, hunting, hobby farming and spending time with his wife and four children. Prior to his legal career Cory served as an Air Battle Manager, leading the Operations Section aboard the USAF’s E-8C Joint STARS. His duties included complex mission planning, intelligence collection, and airborne command and control of close air support, strike aircraft, and artillery. He is a decorated combat veteran of Operation Iraqi Freedom. While court victories are interesting, most clients prefer solutions that don’t involve court. Cory’s practice includes servicing as corporate counsel for many businesses in Southern Minnesota. Most of his files are small matters wherein a business owner or manager has a tough decision to make; Cory is brought in; the issue is dealt with; and business carries on. Many of these small problems include employment issues which have the potential to become large problems. In the past 24 months Cory has dealt with wrongful termination allegations, sexual harassment allegations, claims under the Minnesota Veterans Preference Act, non-compete enforcement and avoiding non-compete violations, unemployment claims, Worker’s Compensation fraud and wage and hour claims. Cory provide vital expertise in a variety of practice areas including Labor & Employment. His expertise includes counsel on employment actions, terminations and discipline; employment agreements, policies and handbooks; labor arbitration; labor relations and negotiations; workplace health and safety, OSHA; employee benefits, ERISA; and workplace training on harassment, discipline, drug testing and other issues. While court victories are interesting, most clients prefer solutions that don’t involve court. Cory Genelin’s practice includes serving as corporate counsel for many businesses in Southern Minnesota. Cory aims to keep small problems small. Most of Cory’s employment files are small matters that Cory keeps small—a business owner or manager has a tough decision to make; Cory is brought in; the issue is dealt with; and business carries on. These include wrongful termination allegations, sexual harassment allegations, claims under the Minnesota Veterans Preference Act, non-compete enforcement and avoiding non-compete violations, unemployment claims, Worker’s Compensation fraud and wage and hour claims. Cory Genelin draws on his experience as a combat leader to draw up plans and policies designed to help an organization operate effectively and accomplish the mission while staying within the bounds of the law. Cory has drafted custom employment handbooks and employment policies for employers of all sizes including nursing home chains, group homes, hospitals, manufacturers, publishers, and agricultural producers.